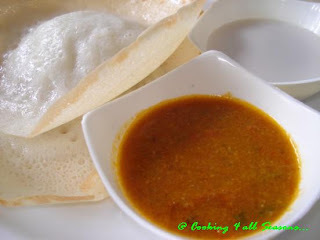 Cooking 4 all Seasons: My Ever Green Appam! Well sorry my appams are white as a pristine! To say I am fond of Appam is saying too little. My attachment to Kerala and its delights started very early, as we were introduced to Kerala feasts on many visits to the different places in Kerala during our vacations. Most were reproducible with equal taste and texture except this Appam. Amma tried many tasted and tested recipes, but none came close to the ones we tasted and enjoyed. Added to that, I had many Mullu friends. But each gave different recipes, still nothing satisfied us. In one of my friend's place, I used to see a big thermocoil box which was used to store these appams. Not sure what purpose they served. But I saw them placed in that box on many occasions. When we don't make Puris for Sunday breakfast, its always because its Appam. That was our passion to this dish. Still we were far from our cheese like texture that comes to the perfect Appam. Finally Amma came up with the perfect recipe! It was such a treat. And now every other sunday, its Appam that I make for Sunday morning. We always make Tomato Kurma for this but once I wanted to try something different that I liked. But hubby dear didn't like it much. So its back to Tomato Kurma. And sweeten coconut Milk for Konda. Previous to non stick appam pans, we used to struggle with iron Kadai. Amma used to coat it with Oil early morning, so that the appam comes out well. Now we get non stick pans and you dont' even know when you had those troubles. This post had been in my draft for so long, because I wanted to make this special for RCI: Kerala. Then I thought I should go with new pictures, so the old one which I took during last april are lost forever. These are new ones and they rock too me thinks. Soak the rices for minimum 10 hrs atleast. Soak the coconut water with sugar for 10 hrs. Grind the rices to smooth batter. Mix the coconut water to the batter and let it ferment over night. Next day, before using add a pinch of soda. Heat the Appam pan. 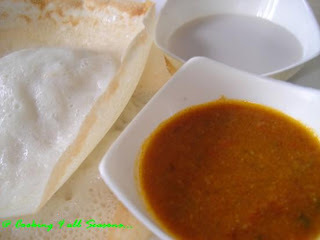 Take a ladle full of batter and pour into the appam chatti. Make swirling movement so that the batter gets coated around the chatti. cover with lid and cook in sim. It will be done in 2 mins. Serve with tomato kurma or Stew. This is my contribution to Regional Cuisine of India, which is started by Lakshmi from "veggie cuisine" and Jyotsna from "Curry Bazaar" is hosting this event this month showcasing the beautiful state of Kerala. Since this is my most favorite comfort food, this goes to Meeta for her Monthly Mingle which is Comfort foods this month.